Any good writer can plot a suspense novel, and take characters from danger to escape/happiness, but I like to dig a bit deeper with my characters. I like to delve into their deepest, darkest fears. Often, those fears mirror my own. For a mother, there is no worse fear than that something horrible will happen to your child. I know this fear intimately. I experienced the death of my first baby, a son born after the most perfect pregnancy with no warning sign of what was to come. After sixteen hours of hard back labor, I gave birth to my first child and immediately knew something was wrong. Fear gripped me like a noose around my throat and I couldn't breathe. My heart raced and my mind soared into all those dark scenarios, ones that led to only one conclusion. I watched as a nurse lifted my son's purplish leg a few inches from the table and then let it drop. He didn't respond or move. My son never cried. I did though. I knew in my heart that I was watching my son in his final hours, and even though I willed him to live, I knew he wouldn't. I would have given anything, including my own life, to have him live. My baby...my firstborn...my little love. He died four hours later, a fluky brain stem stroke. Yes, I know a mother's fears. When my daughter was born a year later, I had survived 9 months of intense fear, but knew that the real terror was just beginning. As she grew, I fought those fears, determined not to be an overprotective mom. I think I did well, all things considered. When the idea for CHILDREN OF THE FOG first came to me, it appeared as a thought. The thought went like this: What if someone broke into my house and kidnapped my daughter? That thought turned into: What if I confronted a kidnapper as he was trying to take her? What would I do? That thought evolved into: I'd fight, of course. I'd fight with all I had. But what if I couldn't fight anymore? Eventually, these thoughts became a plot idea, and the plot brought out my darkest fears. Could I let someone take my child if the only other choice I had was to watch her die in front of me? What a horrible choice that would be. What an unbelievably difficult decision to make. How would someone live with that decision? How long did it take to write CHILDREN OF THE FOG? 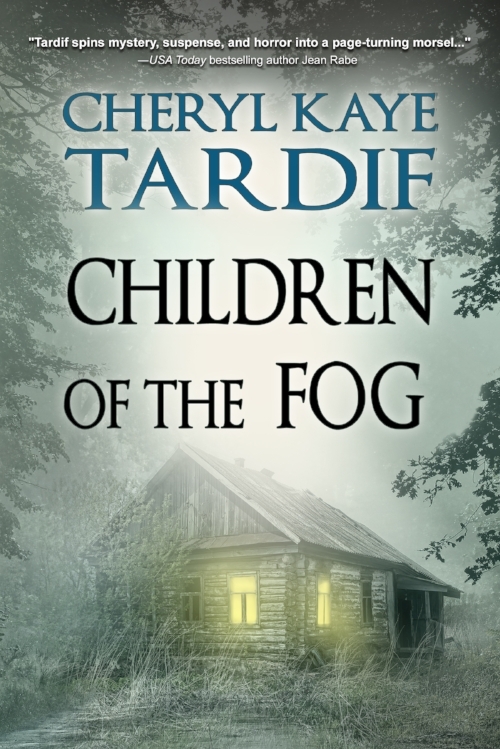 I wrote CHILDREN OF THE FOG sporadically. I started it a couple of years ago, then had to set it aside while I worked on other projects. I returned to writing it and spent about 6 months in total writing and editing. What inspired you to write CHILDREN OF THE FOG? CHILDREN OF THE FOG is a story that came out of a common fear that most parents have: What would I do if someone tried to take my child? How far would I go to save him or her? After losing my first baby after he was born, I had a daughter the following year. She's now 28, but not a day goes by that I don't worry about her. A mother's "job" is never done. They're our babies forever. For an eternity. We want the best for them—always. And what parent wouldn't fight for their child? But what if you were given the choice of letting someone take your child or watching your son or daughter die in front of you? Which would you choose? What if you were beaten and fighting the abductor wasn't a possibility? What if he held a gun to your child's head and gave you 10 seconds make that choice? And how do you live with that afterward? These are the heart-breaking questions I explore in CHILDREN OF THE FOG. Talk about the writing process. Did you have a routine? Did you do any research, and if so, what did that involve? I did a lot of writing at a couple of local coffee shops, including 2 Starbucks. I knew early on that CHILDREN OF THE FOG would be set in Alberta, but I wasn't sure where the cave area would be. When I did my research, I stumbled across Cadomin Cave, which is known to those who enjoy spelunking. The cave was closed to tourists and explorers a few years ago, due to negative impact on the bat life. Other than researching the general layout of the setting, and reading up on PTSD, this novel required less research than most of my others. What do you hope your readers come away with after reading CHILDREN OF THE FOG? I hope readers will come away feeling they were entertained, scared, and inspired to love their kids even more. I'm hoping they'll treasure their relationships with their children. I'm hoping they’ll believe in fate and destiny, and the ultimate power of a parent's love. I'm also expecting many will come away with soggy tissues. Where can we go to buy it? As the author of the new horror Qwickie, INFESTATION, which releases May 11th on Amazon, I’ve already been asked which parts of this story are fiction and which are “inspired by true events,” as the cover says. Well, the majority of the plot is based in truth. After moving to West Kelowna last May, we discovered one house pest after another. First came the spiders. Those chapters are quite accurate. I know—ew! That was a definite infestation problem. Then we had mice—or so my husband and father said. For all I know, they could’ve been rats. Apparently we have packrats (wood rats) in the Okanagan. Double ew! My husband did find a nest and had to destroy it. The maggots and flies? Also quite accurate. We’re still getting treatments for the carpenter ants, and every now and then a body shows up somewhere. So where does INFESTATION veer off into fiction? Let me say this: We were able to rid our home of all unwanted house guests—I mean, pests—and so far we have no other infestations. Or at least that’s what everyone is telling me. Why did I write this story? I figured many of you, especially those who have phobias, would be able to relate. And those who enjoy stories that make their hair stand on end should find it enjoyable. Plus I figured that since each infestation cost me time, money and a huge spike in stress, I should make them “pay.” I may just need extra therapy after all this! So if you haven’t picked up a copy of INFESTATION yet, please do. It’s currently on SALE July 1-7 at only $0.99 US for the Imajin Books SUMMER SIZZLES EVENT!